Hello, sit down please! Oh, my name? My name is Hang. How old am I? I was born in 1987, so please don’t call me chi (older sister), it makes me sound so old! 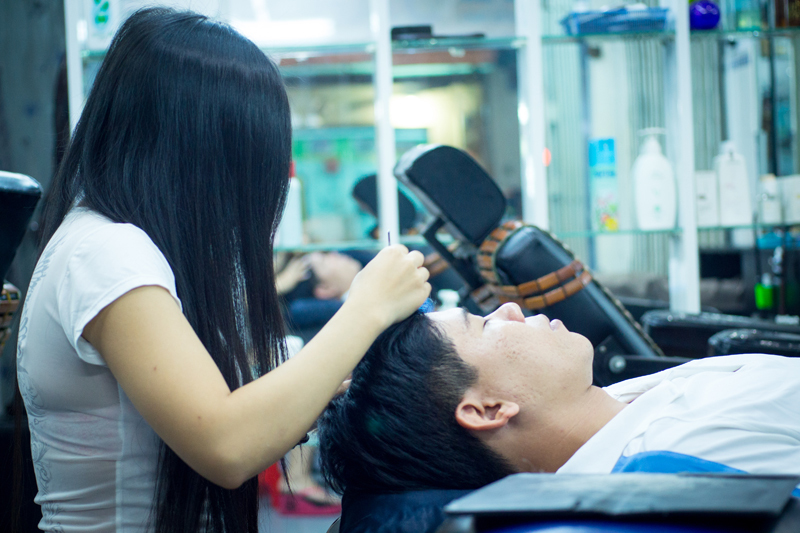 This is one of the first grey hair plucking shops in Hanoi. It’s been open for three years now. I’ve been working here for about a year after one of my friends introduced me to the job. 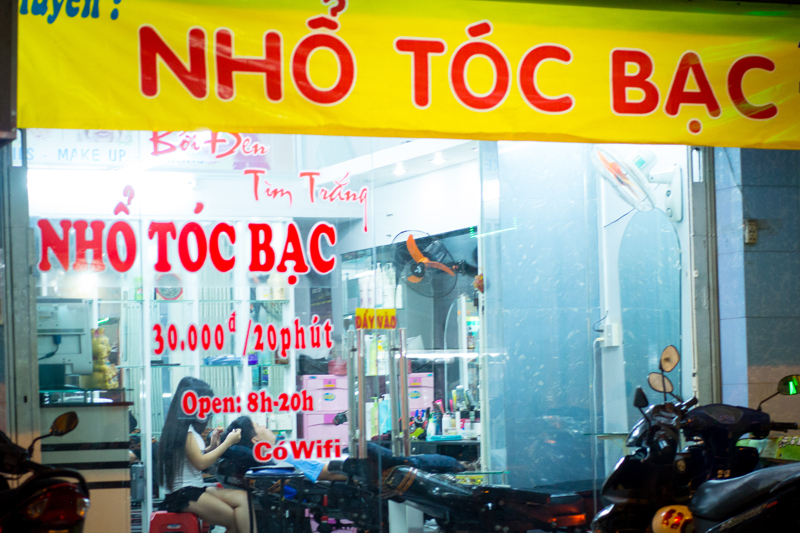 I was born in Hanoi, and I started looking for work after I graduated from high school. For a while, I worked part-time as a sales associate in a clothes shop. For that job, I needed to have a high school diploma and good sales skills. But this is the best job I’ve had by far. I live nearby, so it’s super convenient for me. And while I’m here, well, I’m just here. The work is really easy and suitable for girls. I had to do a week of training before I could become an official staff member. A normal day starts at 9am and ends at 7pm, but the number of customers varies day by day. Most of our customers are office workers and are pretty evenly split between women and men. To work here, you have to be honest, self-disciplined, and there’s definitely no listening to your own music while working. In our store, we only play easy-listening music. I get along well with my co-workers; we’re like brothers and sisters. And the owner is really friendly. He’s easygoing, and he lets us choose whether we want to work full-time or part-time. For Tet he even took all of us out to eat together. One of my favorite things about working here is getting to know the regular customers. They talk a lot while I’m plucking their hair, you know, they share about their family and their lives and stuff. But my boss warned us beforehand, “Don’t get too close to the customers,” so we’re always careful to keep things professional. Actually, some customers really like me; they think of me as a daughter or granddaughter. In the old days, only little kids would pluck their parents’ or grandparents’ white hair right? So customers tend to see me in that light. Nobody ever looks down on me. When I first started my salary was VND1.8 million a month, but after one year I’ll get VND2 million. I get a raise every year on the anniversary of the day they opened the shop, and then some bonuses for working extra days. It’s enough for me. I live with my family and don’t have to pay rent, so I’ve still got lots to go to the café with my friends. And it’s a fair salary, I think. After all, each head takes a different amount of time. 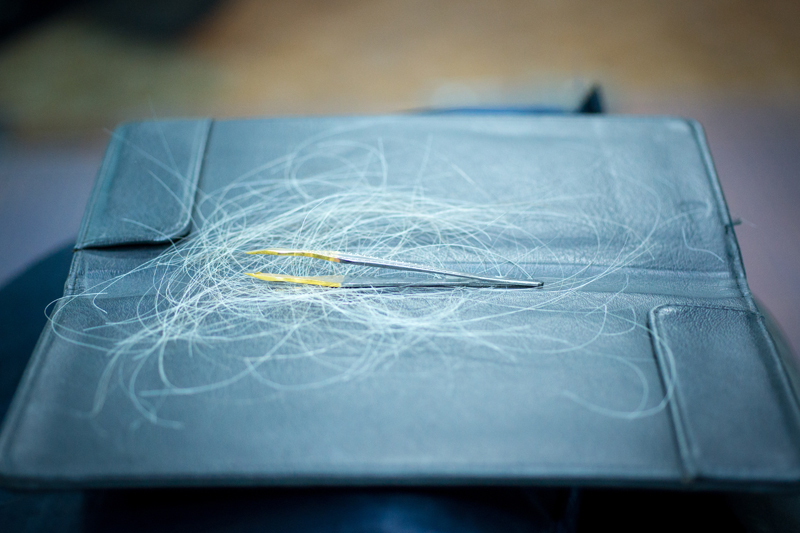 For example, say someone comes in and I spend two hours plucking their hair. That works out to VND60,000 an hour. Plus, I never have to work overtime. There was one day when it was time to close the shop but one of the customers only had half of his head plucked. We just asked him to come back the next day to get the rest of his head plucked. Well, he came back, and we took care of it. Some of my friends were surprised at first when I told them about the job, but when they come and see what I do, they like it. My parents think my job is pretty okay. After they came to see the store, they gave me permission to work here. This shop is different from other hair shops. 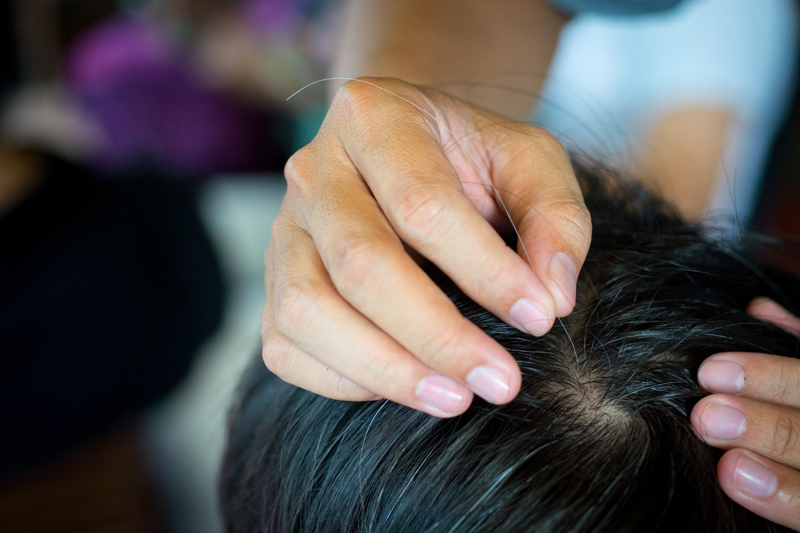 We specialize in plucking white hair, and no customers ask for other services [a reference to massage/sexual services available at many hair salons for men]. The customers here know how to behave. Additional editing by Gerard Sasges Excerpted from It’s a Living: Work and Life in Vietnam Today, available in paperback on Amazon or as an e-book on iTunes. Honor to be served you! Nhổ tóc bạc tại nhà hay ra phố? Nhổ tóc bạc có mọc lại tóc đen?